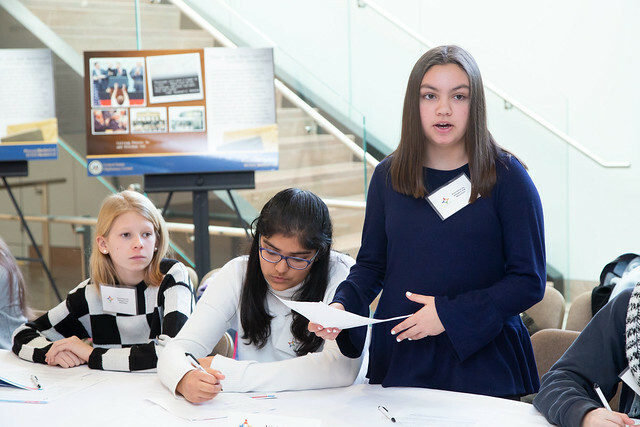 On March 28, the United States Diplomacy Center in collaboration with the Secretary’s Office for Global Women’s Issues and sponsor AnitaB.org hosted a panel discussion on Women in STEM: Past, Present, and Future. U.S. Diplomacy Center Director Mary Kane welcomed the panelists and introduced the Bureau of Education and Cultural Affairs (ECA) Assistant Secretary (A/S) Marie Royce to provide remarks. A/S Royce spoke passionately about her Bureau’s efforts to create space for women in science and technology. She shared information about an exchange program created between NASA, the State Department, and Fox Studios, after the release of the film Hidden Figures about women scientists who were instrumental in the launch of John Glen and turned around the space race. Dr. Wanida Lewis, Senior Economic Evaluation Program Analyst from the Office for Global Women’s Issues, moderated the panel consisting of Liza Mundy, author of Code Girls, Dr. Teresa Williams, an American Association for the Advancement of Science Fellow and TechWomen mentor, and Sandra Cauffman, the Acting Director of the Earth Science Division at NASA. All the panelists spoke about the obstacles that women endure to achieve success, whether socio-political, personal or economic. Mundy began the conversation honoring the more than 10,000 women who served as codebreakers during World War II. Mundy chronicled the story of these women. She explained that after Pearl Harbor, only four percent of women achieved a four-year college degree, because many colleges were not open to women. After Pearl Harbor, the Navy desperately needed talent. Normally, the Navy would recruit at MIT or Harvard, but Mundy found a memo typed in 1941 that talked about a new source of recruits, “women’s colleges.” Mundy described two criteria the women were asked during recruitment: Did they enjoy doing crossword puzzles? (Yes) Were they engaged to be married? (No.) These women moved to Washington and learned the meticulous work of code-breaking. She also elucidated that women were sworn to secrecy regarding their efforts in the war. Their efforts shortened the war by more than a year and saved countless lives, but they were bound to a strict code of secrecy and their efforts almost erased from history. Williams shared her personal struggles to become a scientist. She talked about her family’s financial struggles and how she wasn’t encouraged to pursue math and science, even though she enjoyed the subjects. In community college, when she met her first female chemistry professor, she finally had a vision that she, too, could succeed in science. Her journey included an abusive relationship that set her back and left her with self-esteem issues. But her spirit and people along the way who saw her intelligence and drive continued to support her and she has struggled and come out on the other end. She talked about being a part of the State Department’s Women and Technology exchange program which allows her to be a mentor for women scientists overseas. She understands the loneliness of being a woman in science and she wants to give back, the same way that others gave back to her. Cauffman’s story was equally compelling. She also felt that she might have not been here today, running one of the largest divisions at NASA, managing the satellites observing the earth. Her story began in Costa Rica. Her mom didn’t finish high school, survived being raped and having the child, and held two-three jobs to keep the kids sheltered, clothed, and fed. At seven, she saw the Apollo launch and Neil Armstrong walk on the moon. She told her mom that day that she wanted to get to the moon one day. Her mom, advised her, “Keep that thought in your head, because you never know what the world will bring you.” Her high school wasn’t a good one, so her mom found her one that was two bus rides away or an hour and a half walk, when they didn’t have money for transportation. At 13, her mom got sick and they lost everything, so they had to keep moving around to find shelter. Cauffman took care of her siblings, worked, and went to school and still graduated with the second highest grades in school. Her mother eventually married an American who sent Cauffman to the United States to study. Cauffman worked at a hardware store, and finally got into an electrical engineering program, and still dreamed of working at NASA. In 1991, she finally got the call. She attributes her success to her mother’s spirit of believing that we all have the power within us to make our dreams a reality. As women, all the panelists spoke candidly about women’s struggles, past, present and future. 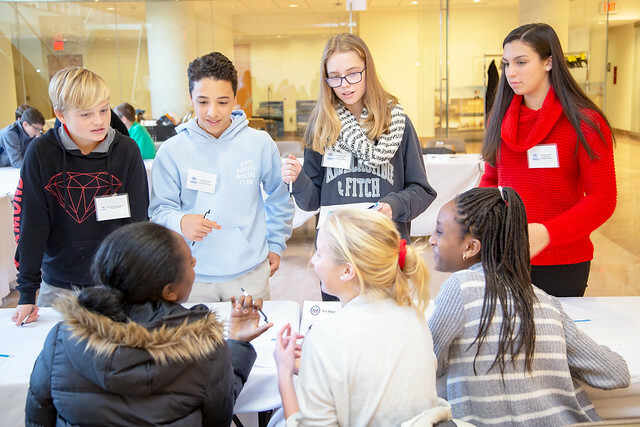 They all also recognized the importance of mentorship for other women and girls and spoke about how they contribute to advancing the next generation of women scientific leaders. Following the panel, AnitaB.org sponsored a reception for the event. 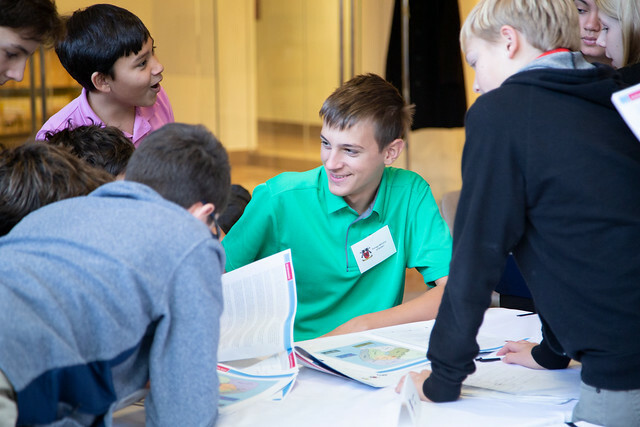 Throughout the day on April 4, the United States Diplomacy Center displayed the accession instruments of the countries celebrating significant milestones since joining NATO. As the depository of NATO, Article 10 of the North Atlantic Treaty provides that “Any State so invited may become a Party to the Treaty by depositing its instrument of accession with the Government of the United States of America.” This is the first time that these instruments have ever been displayed for viewing, and several Foreign Ministers were delighted to have the opportunity to see these historic documents.. The U.S. 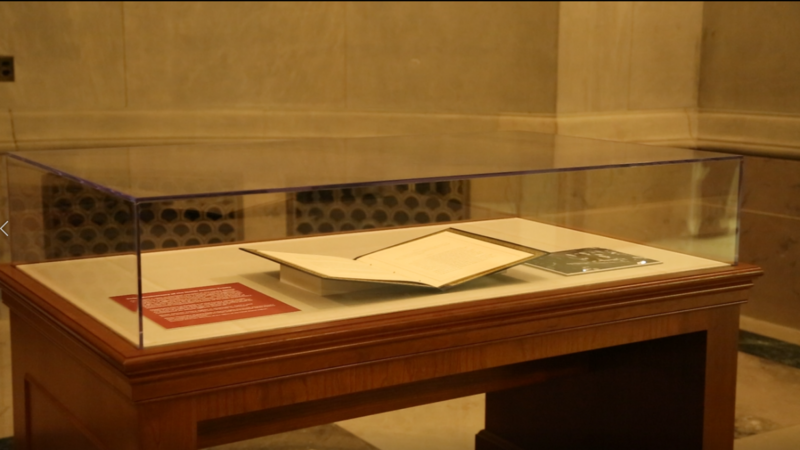 Diplomacy Center, as the State Department’s pending museum on diplomacy and with curatorial expertise, properly laid out and displayed the accession instruments in an archival manner. U.S. Diplomacy Center staff also proudly served as informational docents for the original Treaty at the April 3 event, answering questions about the history of the Charter and NATO. The United States Diplomacy Center partnered with TEDx MidAtlantic Adventures on March 29th to host participants for a day-long engaging, thoughtful, and immersive experiences to highlight the theme of Why Diplomacy Matters: Public Private Partnerships and our National Security, Prosperity, and Global Leadership. 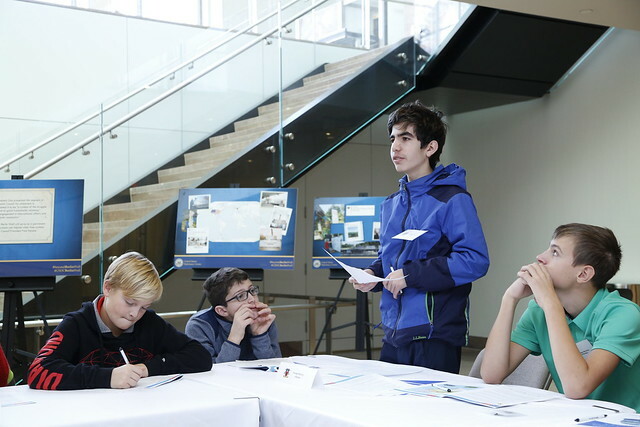 The morning 90-minute simulation, “Freshwater Crisis: Energy Security and Economic Growth”, split participants into several group representing different stakeholders with competing interests regarding an international water crisis. 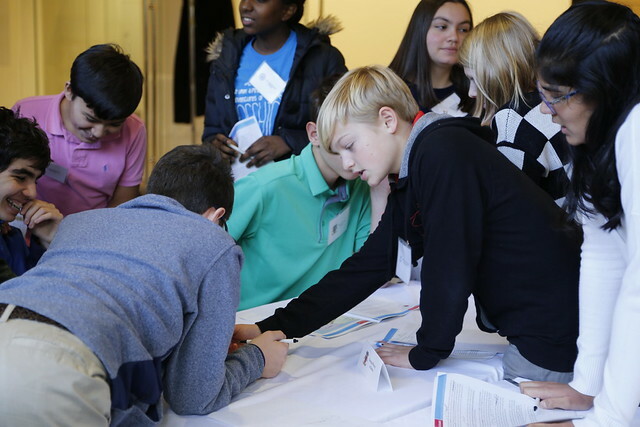 The hypothetical simulation forces participants to negotiate a diplomatic solution. 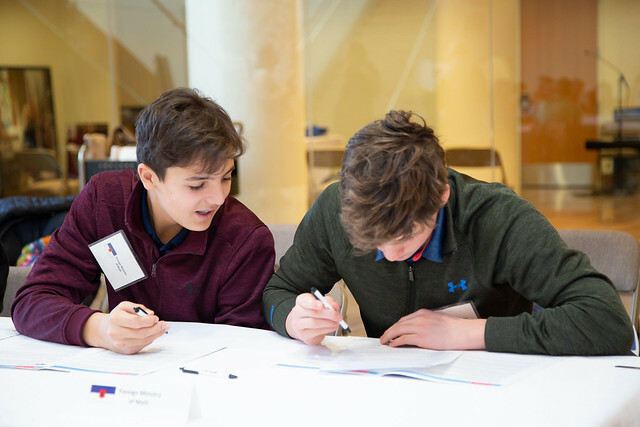 As a result, one steps into the role of a diplomat and experience how diplomacy involves different groups working together in confronting international challenges. Panel members shared ideas and experiences on successful collaborations in various fields related to diplomacy. Panelists then took audience questions and were able to directly share their insights with examples including how the government cannot do everything, the role of the private sector Worldwide, and extending American prosperity globally through diplomacy. The TEDx group consisted of attendees participating the The TEDx MidAtlantic Adventures fall conference in Washington, D.C. entitled “Unbreakable”. The conference goal aimed to empower “resilience” and address what it means to be strong in a changing World, and attracts thought leaders and innovators from across the country for the 2 day event. On May 8, 2019, the Founding Ambassadors Concourse of the United States Diplomacy Center will be dedicated during a special luncheon hosted by the Diplomacy Center Foundation. This very special event will honor individual donors who have received presidential appointments and have donated $100,000 or more. To date, there are 65 Founding Ambassadors and a total of $7.5 million has been raised. The campaign has been spearheaded by Ambassador Stuart Bernstein (ret. ), who serves on the DCF Board of Directors. The Founding Ambassadors is a limited program that will end with the opening of the United States Diplomacy Center in 2022. 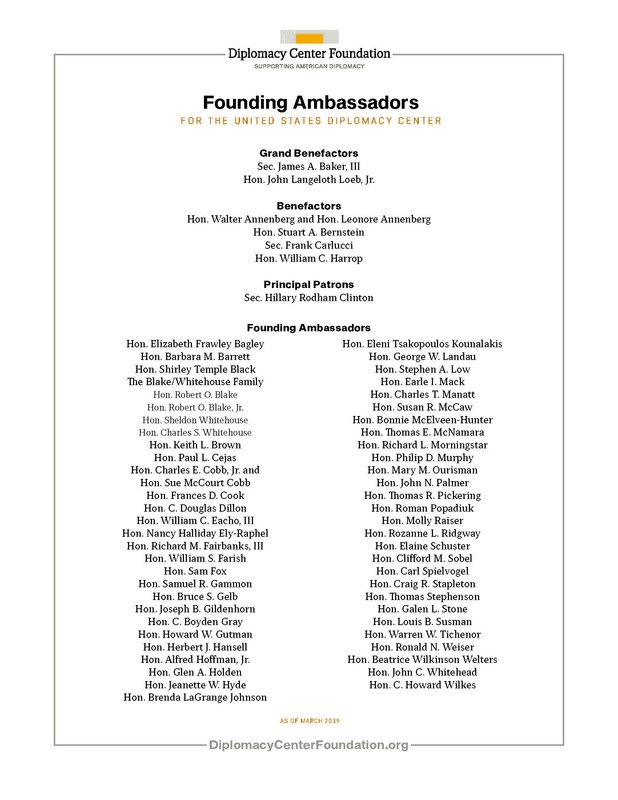 In addition to a donor wall, a biography of each of the Founding Ambassadors will be available for viewing on a digital kiosk. On permanent display in the Founding Ambassadors Concourse, is a Signature Segment of the Berlin Wall with the signatures of many of the world leaders who dealt with the issue at the time, including President George H.W. Bush, German Chancellor Helmut Kohl and Soviet President Mikhail Gorbachev. In October, Smithsonian Exhibits will install the permanent exhibit, which will highlight the leaders associated with this amazing moment in diplomatic history. There will be a timeline and explanation of the artist’s renderings on the wall itself. 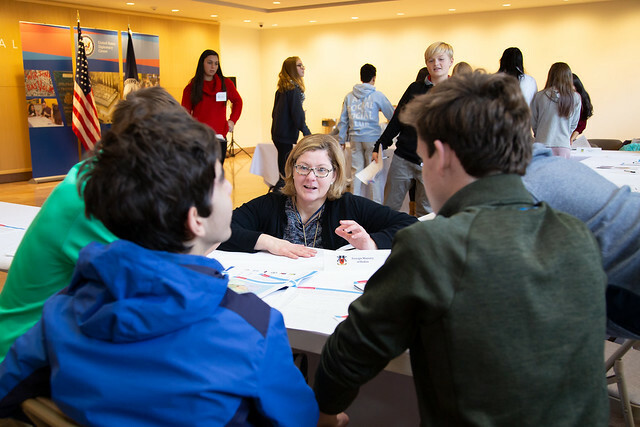 The Founding Ambassadors’ Concourse is currently used for outstanding public events and hosts the very dynamic diplomatic simulation programs for students of all ages, which is administered by the USDC education team. In the future, the Founding Ambassadors Concourse will have a media wall that will help enhance education programming along with a gift shop and café. Patti Morton (right) is presented with a Meritorious Step Increase award by Chief of Mission Hank Cohen in Kinshasa, 1968. Morton received this award for the excellent quality of her work as post security officer, which she took on in addition to her regular duties as secretary to the Administrative Counselor. 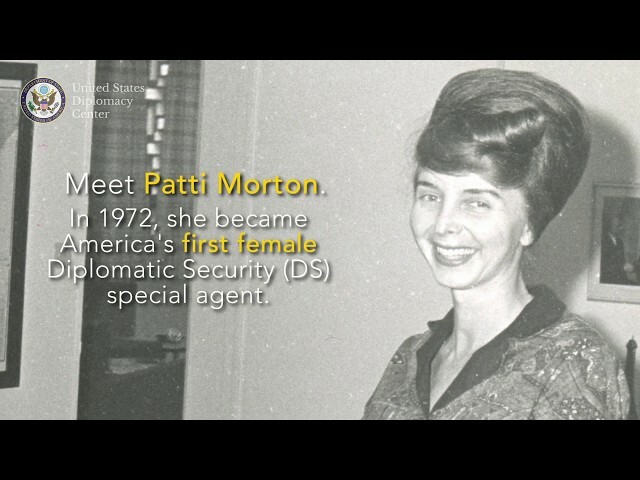 Being the first female special agent, Patti Morton was very aware of the legacy she would leave for women. 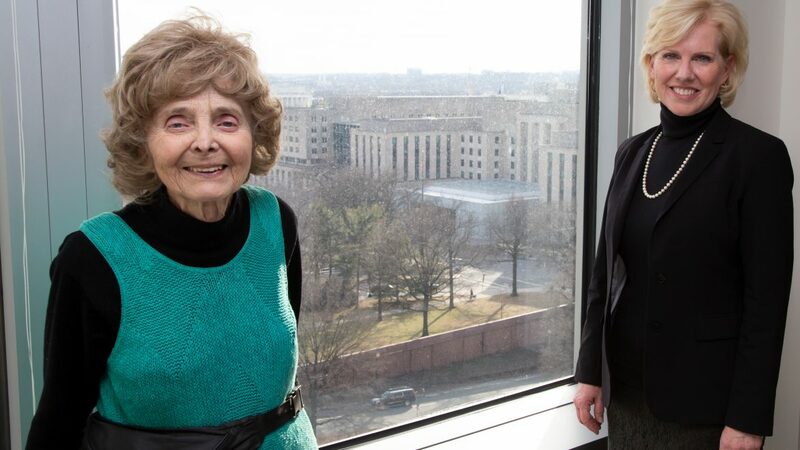 Recently I had the opportunity to meet Patricia Anne (Patti) Morton, the first female Diplomatic Security special agent at the State Department. Recruited as a special agent in 1972, Morton had previously served as a Foreign Service Staff Officer at several diplomatic posts and had received a commendation for her security work in Kinshasa. Patti generously has donated several artifacts to the United States Diplomacy Center museum that illustrate her remarkable career. 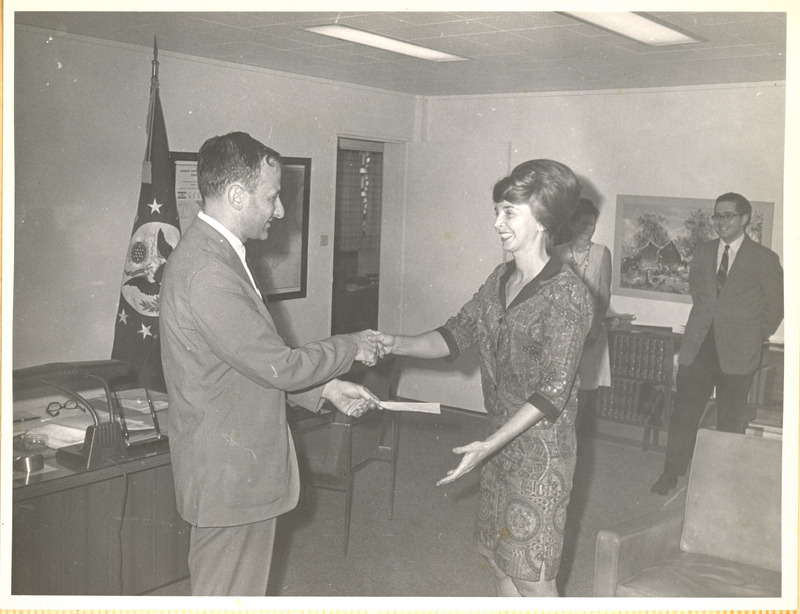 Patti served at U.S. Embassy Saigon as the first female Regional Security Officer. Her duties included supervising the Marine security guards who guarded the embassy. The Marines gave her a camouflage uniform (including a matching elastic hair band) to wear the first time they took her to the shooting range, wanting her to fit in. Though she admitted not knowing where she learned to shoot a gun, she became known for being an excellent shot. While in Vietnam, she wrote the post’s evacuation plan, which was significant as it was put to use during the fall of Saigon in April 1975 and the ultimate evacuation and closure of the embassy. To her surprise, she was told to evacuate Saigon a few weeks before the city fell. She had to leave without any of her household effects, which were never returned to her. In her work as a Regional Security Officer, Patti often led security training sessions and briefings for embassy staff and family members. Patti used these cars to train people at post on defensive driving techniques. If someone was being hijacked or robbed, she showed them how to hit the right points of the cars using these cars as examples. It helped not only the drivers, but also the riders who could give instructions to the drivers on what to do. She said that she would often train the wives of ambassadors, and when the Ambassador’s found out, they started coming to her sessions too. In 2016, she donated this set of toy cars to the Diplomacy Center museum. In her work as a special agent, Patti also used objects to “show and tell” about security measures. She donated to the Diplomacy Center museum a section of bullet-proof glass with an embedded bullet that was stopped by the protective glass. It was given to her at a post to use as an example in her future travels to other U.S. posts abroad and in training sessions about security measures. Back in Washington, she served on protective details for visiting dignitaries. She shared her experience escorting Princess of Monaco Grace Kelly on a visit to the U.S. For formal events, an agent on security detail needed to dress the part. Male special agents were able to rent tuxedos and then charge the cost of their rentals to the office. Since dresses could not be rented, Patti had to purchase formal dresses with her own money so that she could fulfill her duty. She donated two of these dresses to the Diplomacy Center museum. She developed a strong relationship of trust with Grace Kelly during her visit. Upon her departure, Kelly gave her an autographed photo and a clutch – which she admitted was too small to hold a pistol – as a token of appreciation for the protection given by Pistol Packin’ Patti. This clutch was among the items donated to the Diplomacy Center museum. Morton shared a number of the challenges that she faced being the first female agent, including the lack of support she would get from some people of her colleagues, specifically the secretarial staff. She shared the story of having to type all of her documents, memos, and instructions herself, even those that were hundreds of pages, because the secretaries would not do it for her. Being the first female special agent, she was very aware of the legacy she would leave for women. She told us that she would always adapt and make the best with what was available. She had her champions as well as her detractors – she knew that her work was always being watched and evaluated. She weathered the difficult transition from an all-male service to one that included women. At the time, Diplomatic Security did not issue gear for women to carry their weapons. Ms. Morton found her own solution by using a clutch, as seen in the video. In 1974 Patti was assigned to the U.S. Embassy in Saigon as a Regional Security Officer (RSO). As she demonstrates in the video, one of her roles included teaching defensive driving techniques. She carried those same miniature cars around with her to use as a visual aid while teaching. The clutch, cars, and official ID badge -- along with other items, including a camouflage hair scrunchie -- are now part of the Diplomacy Center’s permanent collections. Sheldon Whitehouse, a career Foreign Service Officer, served as U.S. Minister to Guatemala (1929-1933) and to Colombia (1933-1934). Prior to these posts, he used this Special Passport to travel to his post at the U.S. Legation for Greece and Montenegro. The passport is signed by Secretary of State William Jennings Bryan. It was issued on June 30, 1914, just as war was about to break out in Europe. Special passports were issued to prominent officials traveling on government business. They were used during most of the 19th century and into the early 20th century. The Department of State adopted a “passeport diplomatique” in 1918 for officials traveling in the diplomatic service. Starting in 1926, currently serving diplomats as well as former ambassadors were issued Diplomatic Passports. Photographs were not required on U.S. passports until December 1914, and in the case of this passport, would have been added later if the passport was first issued before this date. A description of the bearer’s physical features is also attached on the upper left front side that includes details such as the shape of his forehead and chin, and the color of his eyes and hair. Whitehouse used this passport from 1914 to 1918. It is stamped throughout, on both sides, and additional pages were attached to the right and lower sides to accommodate his many trips. Ambassador Whitehouse entered the Foreign Service in 1908, and served until 1935. His postings included American Embassies in London, Caracas, Paris (twice), Madrid, Athens and Montenegro, St. Petersburg, Stockholm, Washington DC (Chief of the Near Eastern Division), Guatemala, and Colombia. He was witness to major post-WWI efforts to secure peace in Europe. As Counselor of the U.S. Legation in Sweden in 1919, Whitehouse was a participant in the American Commission to Negotiate Peace at Paris. In 1927, as Counselor of the embassy and Charge d’Affaires in Paris, he facilitated early discussions that would result in the Kellogg-Briand Pact of 1928. The Whitehouse family has a long legacy of public service. Sheldon Whitehouse’s son Charles, a career FSO, served as U.S. Ambassador to Laos (1973-1975) and Thailand (1975-1978). His son-in-law Robert Orris Blake, a career FSO, served as U.S. Ambassador to Mali (1970-1973). His grandson Robert Blake Jr., a career FSO, served as U.S. Ambassador to Maldives and Sri Lanka (2006-2009), Assistant Secretary of State for South and Central Asian Affairs (2009-2013), and U.S. Ambassador to Indonesia (2013-2016). His grandson Sheldon Whitehouse currently serves as a U.S. Senator for Rhode Island. 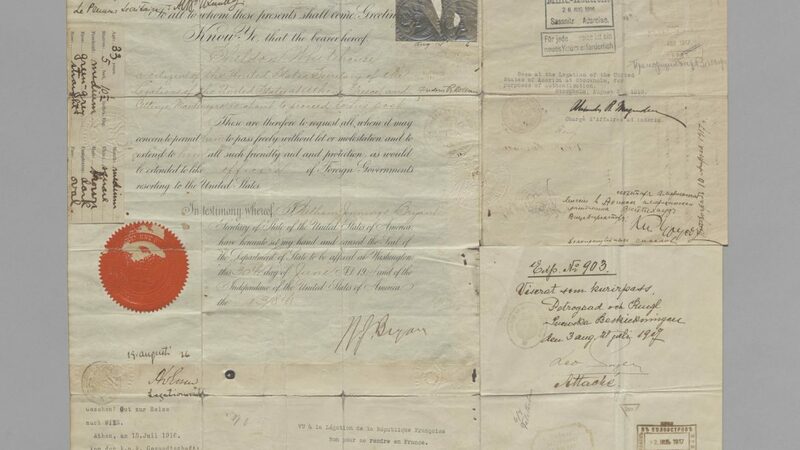 Read more about passports in our collection, including a 1798 passport and an 1859 passport. 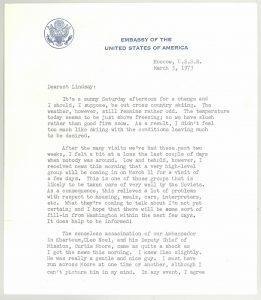 Letter from Ambassador Adolph Dubs to his daughter Lindsay March 3, 1973. 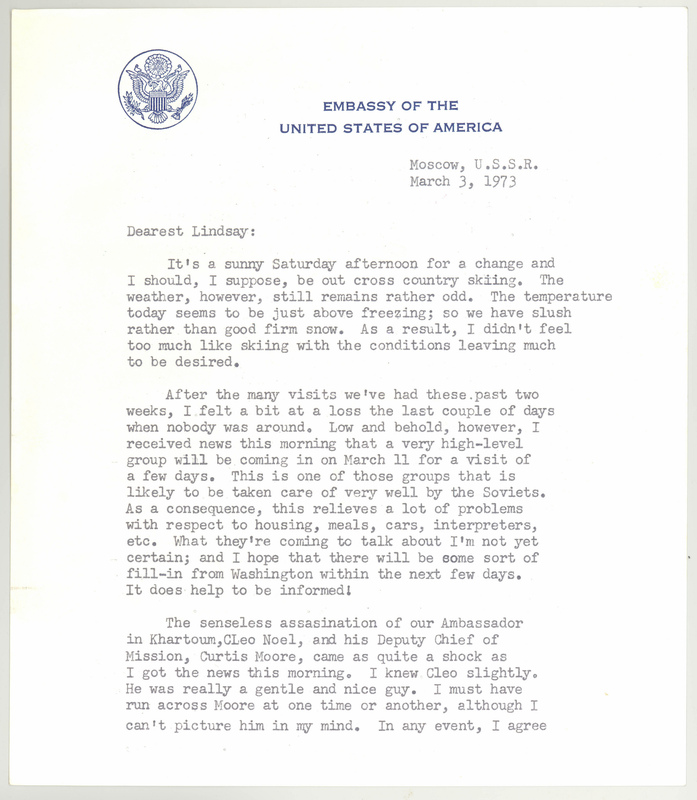 This letter was donated to the Diplomacy Center collection from Lindsay in 2018. Adolph “Spike” Dubs was a career Foreign Service Officer and noted Soviet expert. 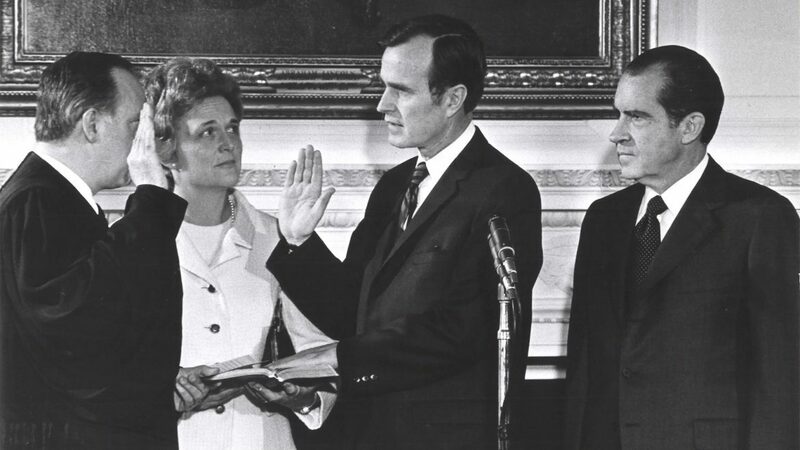 In 1973-74 he served as charge d’affaires at Embassy Moscow, and in 1978, he was appointed U.S. Ambassador to Afghanistan. On February 14, 1979, Ambassador Dubs and his driver were stopped in their car by armed militants posing as police. They overpowered both of them and forced the driver to take them to the downtown Kabul Hotel. There they held Ambassador Dubs at gunpoint and demanded the release of a political prisoner. Despite pleas from U.S. officials to keep the situation as calm as possible while they tried to negotiate the ambassador’s release, Afghan and accompanying Soviet officials hastily mounted a heavily armed rescue attempt. Ambassador Dubs was assassinated during the attempted rescue. The exact identity and motive of these kidnappers still remains a mystery. Ambassador Dubs was a prolific letter writer during his diplomatic career. He kept in close contact with his daughter Lindsay who was in her 20s during this time. He opened his correspondence with “My Dearest Lindsay,” and relayed details of his official duties, conversations, and trips to local sites. 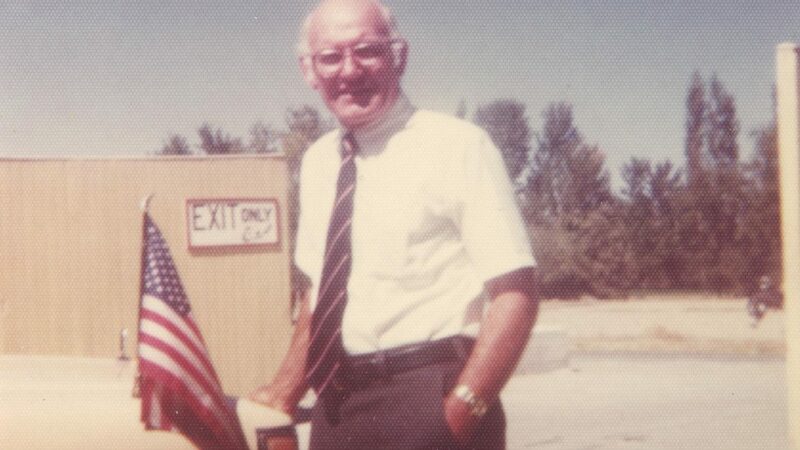 He also dispensed fatherly advice, concern, and encouragement – all communicating how much he loved and missed her. …we cannot afford to give in to the ransom demands made by thugs who direct such organizations as the Black September Group. 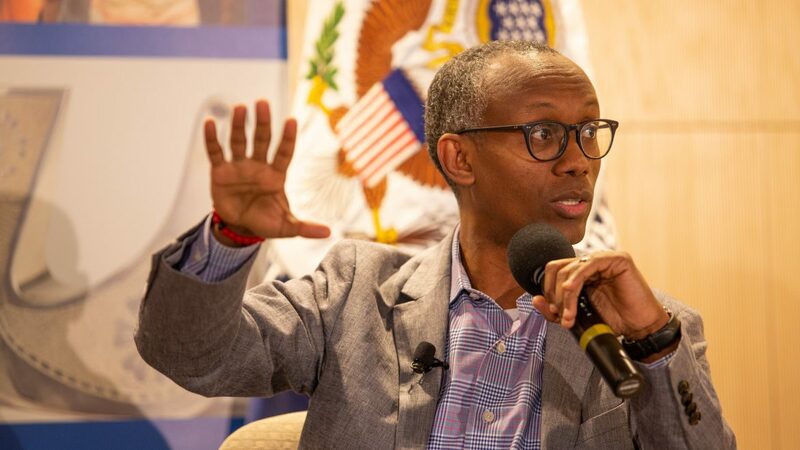 I personally don’t like to think of being any kind of a martyr; but if I were ever taken in a situation such as that which occurred in Khartoum, I would want Washington to understand that I would rather sacrifice my life than to have someone capitulate to the demands of terrorists. The next time a U.S. ambassador was killed at post was in 2012, with the death of Ambassador Christopher Stevens in Benghazi, Libya. Read the full letter in high resolution or learn about contributing to the collection. 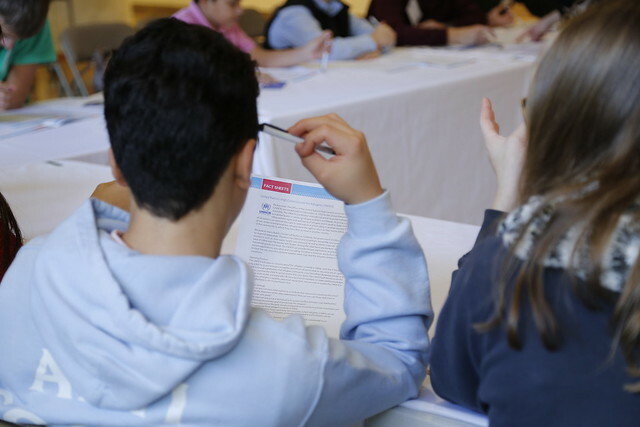 Take a look at the Diplomacy Center’s free class materials or video walk-throughs. On November 30, 2018 former President George Herbert Walker Bush died at age 94. A distinguished Navy pilot in World War II, former President Bush lived an accomplished life, serving his nation in various capacities, including: President, Vice President, Director of the Central Investigative Agency, Member of both the House and Senate, and as a diplomat, serving as U.S. Ambassador to the United Nations and Head of U.S. Liaison Office in China. In addition to serving his nation, Bush was a businessman and humanitarian. Today, the United States Diplomacy Center in Washington, D.C. is home to the Signature Segment of the Berlin Wall. 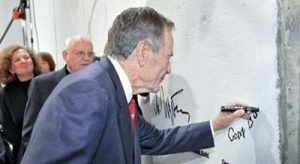 This 13-foot high, nearly three ton piece of the wall has been signed by 27 leaders who played a significant role in advancing German reunification. They include U.S. President George H. W. Bush, U.S. Secretary of State James Baker, German Chancellor Helmut Kohl, Soviet Premier Mikhail Gorbachev, and Polish labor union leader and Nobel Peace Prize Laureate Lech Walesa, among others. Leipzig artist Michael Fischer-Art painted this segment, depicting protesters during that city’s own “Peaceful Revolution” demonstrations in 1988-89. Fischer-Art had created many of the original banners protesters carried as they chanted, “Wir sind das Volk” (“We are the People”), “Freiheit” (“Freedom”), and other pro-democracy messages. His previous diplomatic experience as the Ambassador to the United Nations came in handy when, as president, he received word that Iraqi forces had crossed into Kuwait. In the first five days after the invasion, Bush personally telephoned international leaders on at least forty-eight occasions—from the White House, while in-flight aboard Air Force One (where he called King Hussein of Jordan and President Mubarak of Egypt on the first day of the crisis), and from Camp David. Bush also immediately called Thomas Pickering, U.S. Ambassador to the United Nations. He instructed Pickering that he wanted the United Nations to respond swiftly to the invasion. From the outset, Bush viewed the crisis not as a regional Arab-to-Arab dispute, but as something larger. Bush “was keenly aware that this would be the first post–Cold War test of the Security Council in crisis.” While most U.S. presidents had warily turned to the United Nations in an international crisis, Bush’s immediate call to the United Nations paid dividends. On the day of the invasion, the U.N. Security Council passed resolution 660 by a 14–0 vote, demanding that Iraq withdraw from Kuwait. Significantly, the Soviet Union and China did not veto the resolution despite the fact that Iraq had been an ally and a recipient of Soviet military aid in the past. Bush’s decision to involve the United Nations served as a foundation for his strategy of “coercive diplomacy” — using limited force as a negotiating tactic — over the next five months. Having served as U.N. ambassador meant that he understood both the institution’s limits and strengths and had confidence in its diplomatic mechanisms. On a lighter note, Bush was known as the “Original Sock Diplomat.” Bush has an assortment of colorful, graphic pairs suited to every occasion. He wore red, white and blue striped numbers to the White House for the unveiling of his son’s official portrait in 2012; Bill Clinton socks to a meeting with Mr. Clinton; and socks from a company started by a man with Down Syndrome on World Down Syndrome Day. Often, the 41st president tweeted about his socks. His affinity for them became even more obvious after he began to use a wheelchair, as his ankles were exposed. He was laid to rest in gray socks patterned with fighter planes flying in formation, and it’s not just because of his service as a naval aviator. It was because, as he wrote of himself in a 2014 fundraising email for the Republican National Committee, “I’m a self-proclaimed sock man. The louder, the brighter, the crazier the pattern — the better.” The week of his passing, a veritable outpouring of creative hosiery appeared on social media and on the streets and in schools, all in honor of Mr. Bush, himself a famous practitioner of the art of sock diplomacy. Business owners encouraged employees to wear socks with lighthearted designs, students were urged to get creative, and a hashtag was created, #SocksforBush. In this piece, the Diplomacy Center honors former President Bush’s service to the nation and the world.